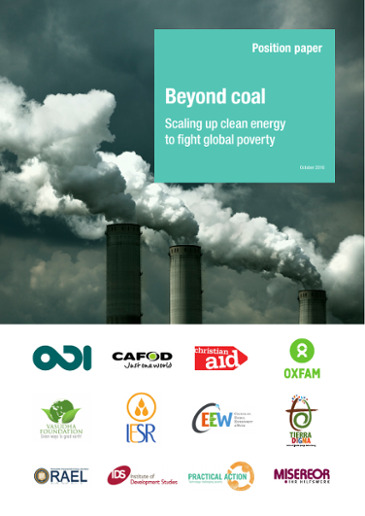 Practical Action has been working for over three decades to get sustainable energy solutions to those who need them most; but we recognise that our work alone is not enough to reach the billions who still currently have no access to clean, safe, modern and affordable energy. Working in partnership and collaboration with others, and within various frameworks, is therefore key to our approach. 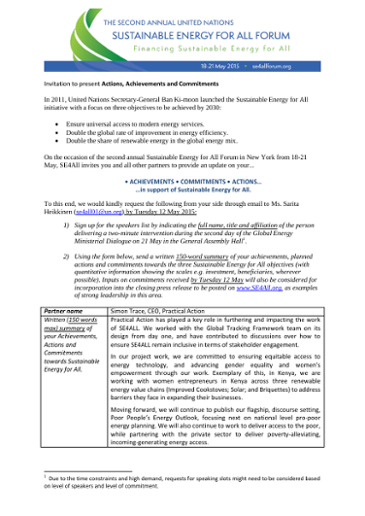 Recognition of the fundamental role of energy in development has increased dramatically in recent years, and the UN's Sustainable Energy for All initiative (SEforAll) has been a key driving force in elevating the status of energy access globally. Since SEforAll's inception in 2012, it has been widely understood that, for these primary goals to be achieved, three groups need to work together: government, the private sector and civil society. This multi-stakeholder approach has been supported by Practical Action from the very beginning. 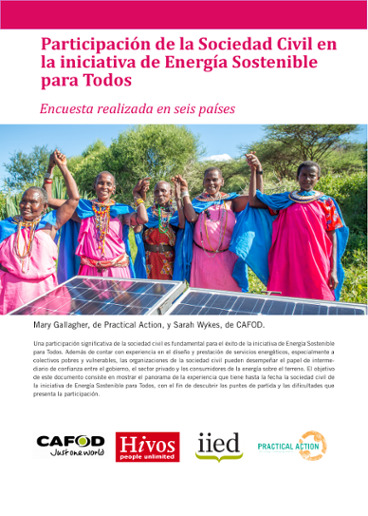 We have worked with the SEforAll initiative from the very beginning; we previously participated on the Energy Access Committee, and have served on the SEforAll Forum's steering committees in both 2014 and 2015. We have worked closely with the initiative in Kenya, Zimbabwe, Nepal and Rwanda; and, more recently, Nigeria and Sierra Leone through our involvement in Power for All. The SEforAll goals will only be achieved with the participation of civil society organisations. 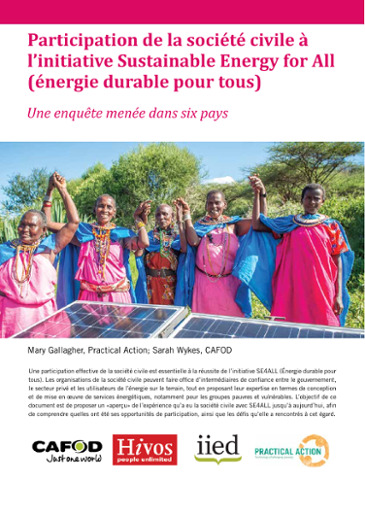 Civil society's long-standing and invaluable experience of delivering vital energy services to those beyond the reach of national grids, and our ability to connect and represent the needs and experiences of poor communities, must be valued and integrated into the process. Recognising this, Practical Action is a founding member of the ACCESS coalition which strengthens the voice of civil society in initiatives such as SEforAll. 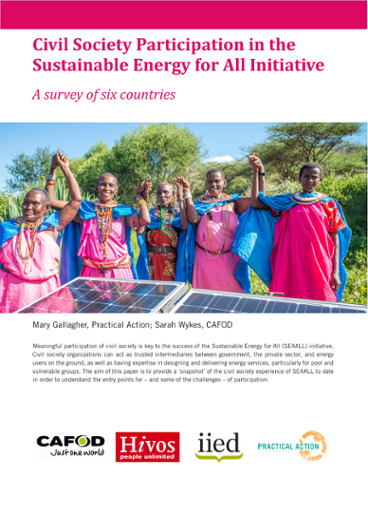 Practical Action has also worked with a number of development and research organisations (including CAFOD, Christian Aid, HEDON, IIED, IESR) to broaden our reach and amplify our messaging. 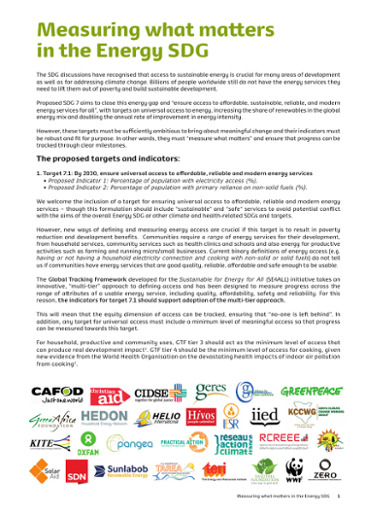 We have collaborated around energy access and climate change issues advocating for, among others: additional investment in decentralised energy services by DFID, EU and the multi-lateral development banks (MDBs); greater understanding of, and buy-in to, participatory design and delivery of energy services; and a more meaningful, demand-focussed definition of energy access. 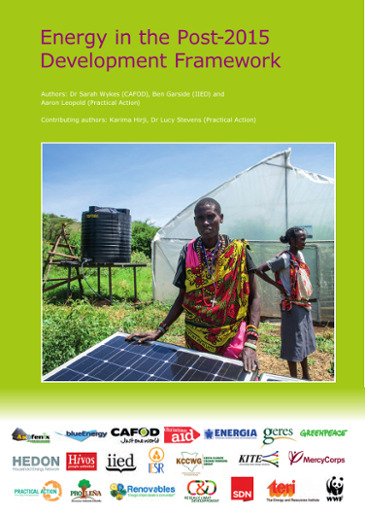 Most recently we worked with ODI, GOGLA and SolarAid, on a comprehensive report on off-grid solar markets in Africa, a piece of work which underlies DFID's Energy Africa campaign.